Operating Era: 1903-1960. Heinz Pickle Tank Car, Claussen Pickle Tank Car. First built in 1894 by Heinz to carry cucumbers from salting stations to bottling plants, the design was standardized about 1902 when Middletown Car Co. produced a similar car for the trade. Claussen purchased 4 cars for its 4 salting stations in IL and IN. The cars likely ran into the early 1920`s. 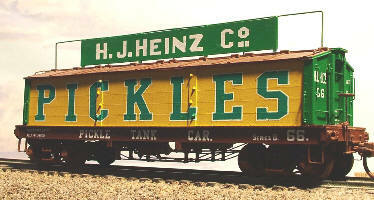 Heinz had 41 pickle cars, most of this design. We offer two of the paint styles used: kit 2202 is has yellow sides with green and white lettering on 1907 and later; kit 2203 has oxide sides with red and white lettering of 1900-1907. Heinz cars lasted in quantity through the 1920`s and one as long as 1950.